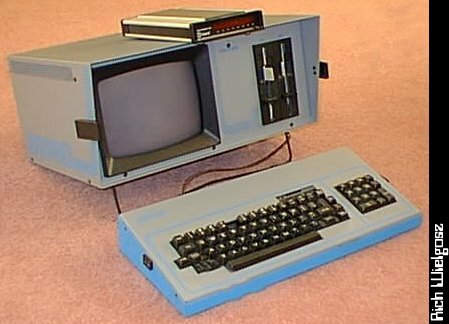 This is the Kaypro I CP/M machine that I purchased in 1986 on which to run a BBS. A local CP/M and Kaypro guru had a discount coupon that Kaypro gave its better customers (he already had 3 or 4 Kaypros of his own), which allowed them to get something like 30% or 40% off of a new machine. This gentleman gave me his coupon and I was off on my first non-Commodore computing adventure. I think I paid in the vicinity of $600 for the machine. On top of the machine can be seen the actual Hayes Smartmodem 1200 that I purchased to use with the BBS. I mail ordered the modem from out of state thereby avoiding tax and it still cost me $406! That was actually a good price for the time (again early 1986). It's also interesting that the Hayes Optima 28.8 modem that I got for free looks identical to it from 5 or more feet away! This machine enjoyed several years of good use as a BBS until I finally replaced it with an XT Clone on which I ran the MSDOS version of the same BBS software. Believe it or not, up until 3 or 4 years ago it was still used by one of my friends while he was in college to write papers. Incidentally now that I am running Linux on my spare machine I once again have the BBS bug and am considering running the same BBS software that I ran years ago, CITADEL, but running the multi-user UNIX version and making the BBS Telnet-able. Click here to view all comments for the Non-Linear Systems Kaypro I and to leave your own. Click here to view comments about other Non-Linear Systems computers.